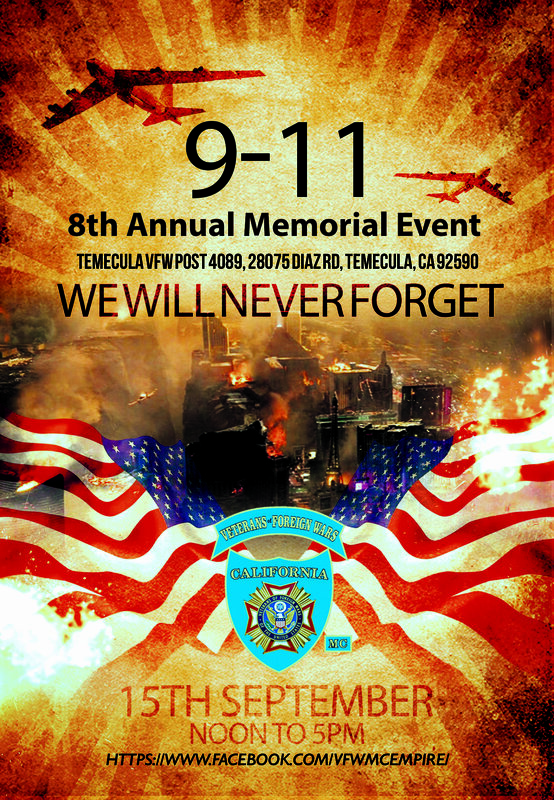 On Saturday, 15 September 2018, the VFW MC is presenting the Eighth Annual 9/11 Memorial-themed motorcycle event to benefit the California Veterans of Foreign Wars and other Veteran Charities. Based on the past seven events; we hope to attract a large community population in addition to the strong motorcycle community that support our events. Money raised during the past iterations have helped us to support The Warrior Foundation-Freedom Station, The Southern California Veterans Alliance, Paws For A Cause, 4 Paws for Patriots, two Equine Therapy ranches for PTSD patients as well as providing aid to 13,000 veterans’ families with food boxes, clothes, toiletries and other items as needed. Due to generous corporate sponsorship and funds raised at this year’s event, we hope to continue these and other works. At this year’s event, we will have food, entertainment and raffles to generate additional revenues. All gift donations will be raffled off as prizes and monetary donations will be added to supporting Veterans in need. All benefactors will be publicly credited for their donations.